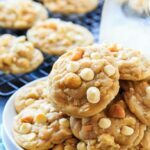 These White Chocolate Macadamia Nut Cookies are fabulously soft and chewy with lots and lots of white chocolate chips and crunchy macadamia nut pieces. 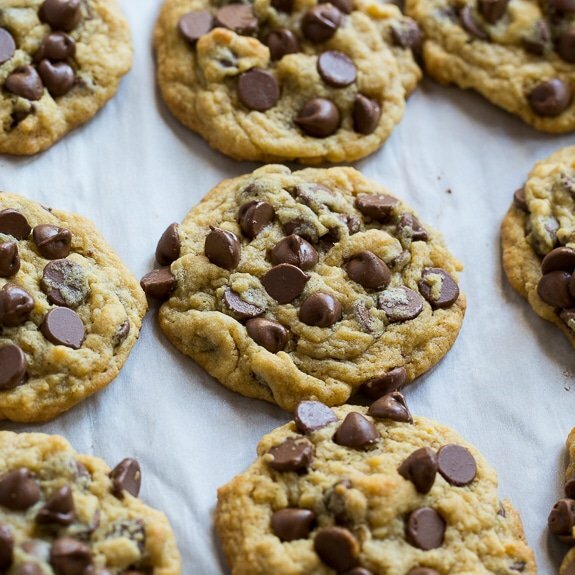 Cookies really don’t get much better than this! They’re big and chewy and they keep well. They retain their fresh out of the oven taste a day or even two later. They’re not likely to last much longer than that! 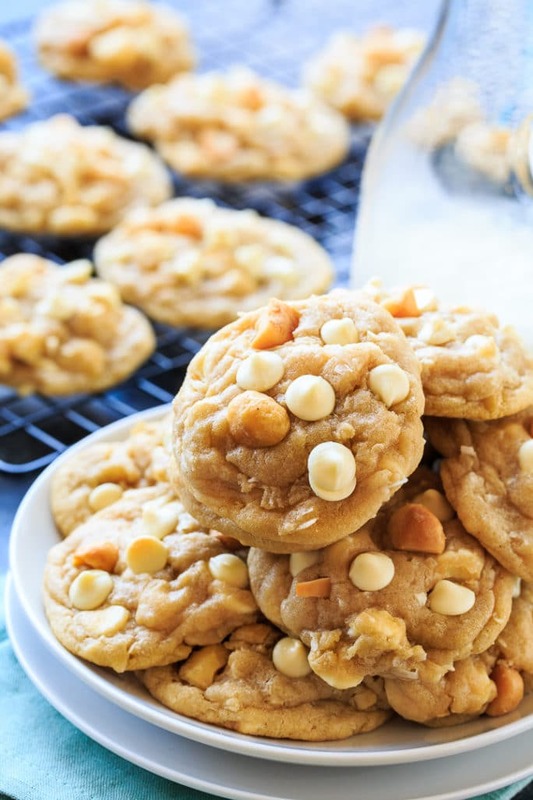 This White Chocolate Macadamia Nut Cookies recipe is from Sally’s Baking Addiction. If you’re an avid baker, you most likely have tried a few of her recipes Or maybe you even have her cookbook. I’ve never had one of her recipes go wrong. 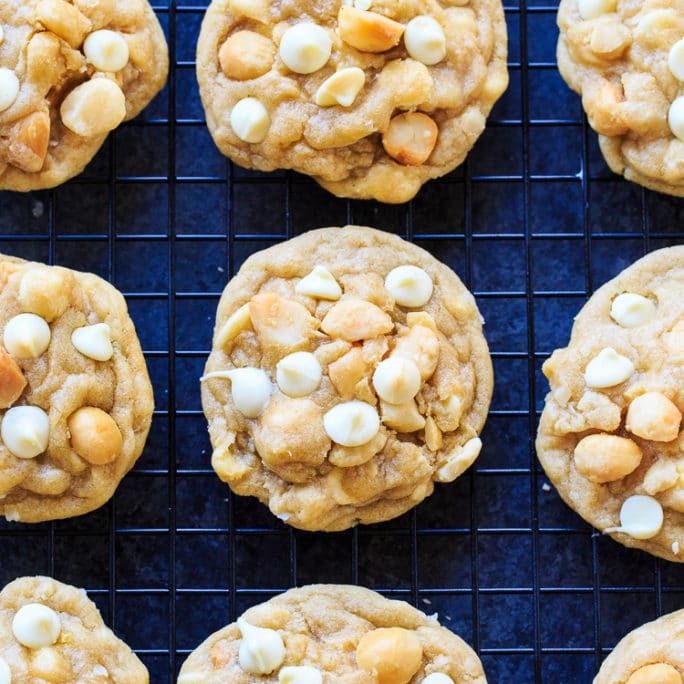 The dough for these White Chocolate Macadamia Nut Cookies comes together really fast, but the eggs do need to be at room temperature and the dough needs to be chilled for at least an hour before it is baked, so plan ahead. You can actually make the dough a day in advance which is super convenient. I added a 1/2 cup of finely shredded coconut to the batter because I love the taste of coconut with white chocolate and macadamia nuts. I found 1/2 a cup was enough to add a little flavor and interest, but not compete with that simple and classic white chocolate/macadamia nut flavor combo. 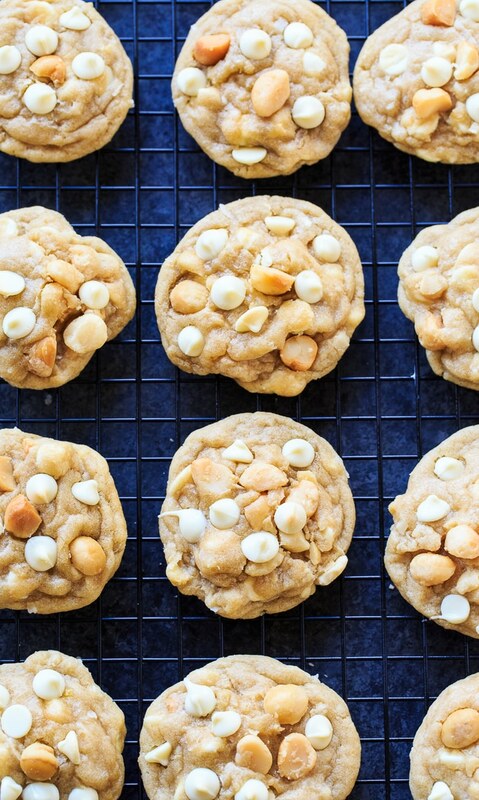 To get the cookies looking picture perfect, I press a few extra white chocolate chips into the balls of dough just before popping them in the oven. That way, you can be sure plenty of white chocolate chips are visible on top. Makes them look so mouth watering! I’m ready to pour myself a glass of milk just looking at pictures of them. Using an electric mixer (stand or hand-held) cream butter and both sugars. Add egg, egg yolk, and vanilla and mix until combined. Add flour mixture in three batches, mixing in between additions. Stop mixing once all flour is incorporated. Shape dough into 1 1/4-inch balls. Place on baking sheet, leaving plenty of room in between. You will need to bake them in batches. Keep extra dough refrigerated until you are ready. Press a few extra white chocolate chips into the top of each dough ball. Bake for about 10 to 11 minutes . They will still look a little undercooked in the middle. Let cool for a few minutes on the baking sheet and then remove them to a rack to cool completely. 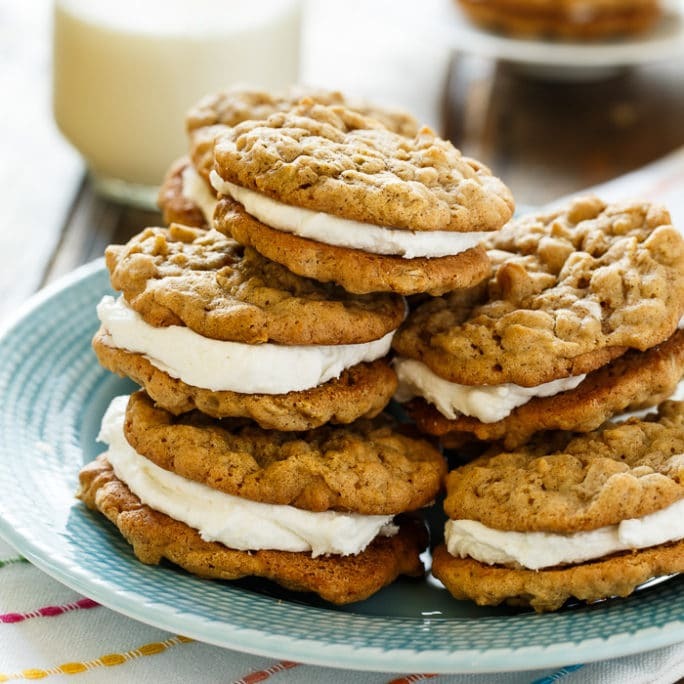 This entry was posted in Cookies and tagged cookies, macadamia nuts, white chocolate. Bookmark the permalink. 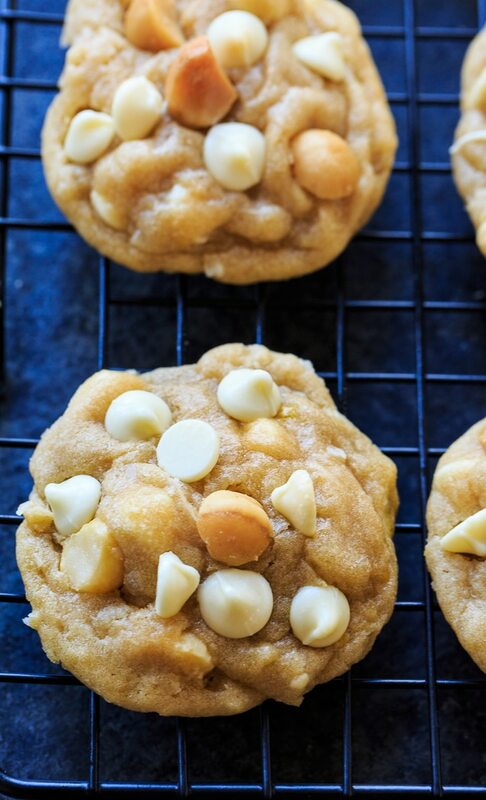 White chocolate macadamia nut cookies are some of my favorite! It’s been too long since I’ve made them! This is one of my favorites to buy in the bakery at the grocery. I bet homemade is 1,000 times better. Such a beautiful article and the meal is so elegant.